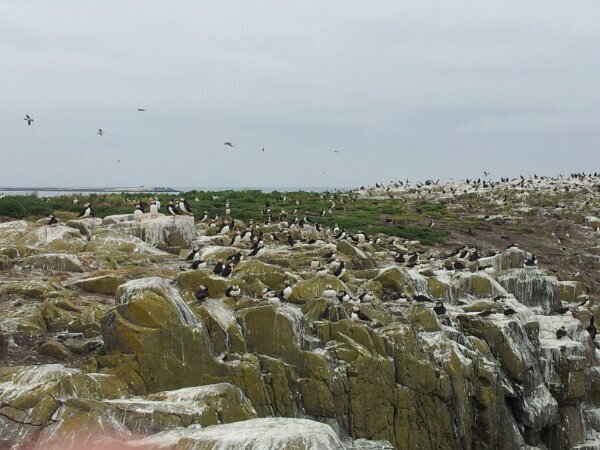 The Farne Islands, England lie at 55 degrees N. Off the coast of Northumberland, they’re not too far from Newcastle, England and Edinburgh, Scotland. I took a boat trip out to the islands a few weeks ago and saw thousands of puffins. The black and white birds were diving, bobbing, and flying with fish in their beaks. Puffins are usually associated with the Arctic, so I was surprised to see them in the country I’ve called home for the past ten months. Even though I wasn’t really that far north – still eleven degrees south of the Arctic Circle – the presence of puffins made me feel closer to the Arctic than I have since I was in Tromso in January. 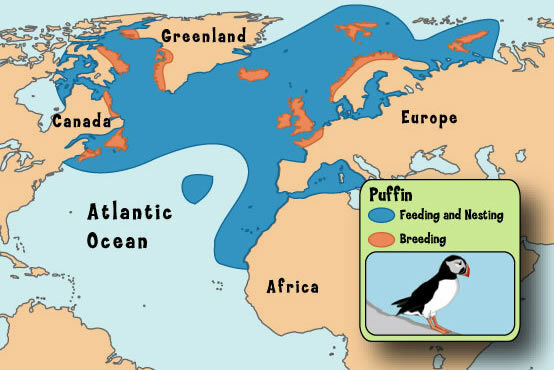 Visualizing the extent of the puffin habitat and the Viking raids helps us to reconceptualize what the Arctic means and to understand its place in relation to the rest of the world. The region can be defined beyond a strict adherence to lines of latitude like the Arctic Circle. In their own ways, puffins, and the Vikings before them, help link the circumpolar north into more southern-lying lands like Spain and Morocco. The flight of the puffin, which winters south of the Arctic, reminds me of the fish protein commodity chain that begins up in the Lofoten Islands, Norway, where I saw Lithuanian fishermen hanging cod to dry. The protein powder made from ground up fish heads would be sent on to Nigeria – yet another North-South chain, this time to do with goods rather than animals or people. As for the UK, a lot more connects the country to the Arctic than puffins. Klaus Dodds, a geography professor and Arctic specialist at Royal Holloway, and Duncan Depledge, his doctoral student and a researcher at the Royal United Services Institute for Defence and Security Studies (RUSI), outline what they see as the country’s priorities in a RUSI report. They write, “The UK has a 400-year-old relationship with the Arctic, created and consolidated by exploration, science, security, resources, commerce and the popular imagination.” The near hero-worship of explorers like Robert F. Scott and television shows like BBC’s Frozen Planet attest to the continuing prominence of the Arctic in British popular culture, even if Westminster isn’t paying the High North (or even the north of England, for that matter) too much heed. The resources mentioned by Dodds and Scott pose an interesting conundrum. If Scotland becomes independent, it could position itself as an Arctic state – one with oil in the North Sea. Furthermore, Scotland is fewer than 300 miles from the Faroe Islands, which call themselves “an island nation in the West Nordic region of the Arctic.” The Shetland Islands, part of Scotland, are only 200 miles away. Since the Faroes are part of the Kingdom of Denmark, Copenhagen views these islands as important for its overall Arctic strategy. The Faroe Islands have even published their own strategy for the region. It’s just a hop, skip, and a jump from Scrabster, in northernmost Scotland, to the Faroe Islands. An enterprising soul could even hitch a ride on one of the fishing boats that ply the waters between Scotland and the Faroes. Hitchhiking to the Arctic: now that would demonstrate that the High North isn’t really all that remote or inaccessible. Alaska and Arctic shipping: Boon or boondoggle?